Colin joined Watsi on March 12th, 2013. Three years ago, Colin became the 1437th member to automatically support a new Watsi patient every month. Since then, 3,669 more people have become monthly donors! Colin's most recent donation traveled 8,300 miles to support Mya, a teenager from Burma, to fund gynecological surgery. Colin has funded healthcare for 16 patients in 8 countries. 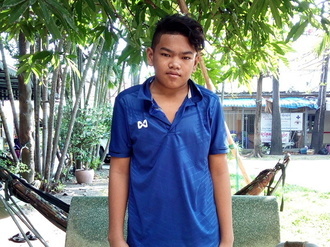 Ratha is a 15-year-old from Cambodia. He has two brothers and two sisters. He is the middle child. His favorite subject in school is Khmer history. When he grows up, he wants to own his own business in his village. He enjoys eating rice with pork and beef and drinking Coca Cola. In his free time, he likes to swim in the local river and watch TV with friends. Two months ago, he was in a motorcycle accident and fractured his right leg. Ever since, it has been painful and difficult to walk. He traveled for eight hours to come to our medical partner for an osteotomy surgery to repair the fracture. The procedure is scheduled for February 6 and will cost $390. His family needs help raising money. He says, "I hope I can walk without pain again after the surgery. Then I can swim again in the river." 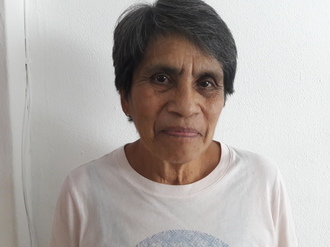 Eliza is a 67-year-old woman from Guatemala. She has diabetes, but she cannot afford medications to control her blood sugar. Consequently, she has developed cataracts and lost her eyesight. Eliza is a mother of three and grandmother of two. She used to work as a baker, but her vision loss has forced her to abandon this passion. She loves to spend time with her two granddaughters, and she hopes to teach them to bake. Fortunately, on December 2, Eliza underwent cataract surgery supported by our medical partner, Wuqu’ Kawoq. After recovery, she will have clear vision for the first time in years. Our medical partner is requesting $1,500 to cover her pre-op labs, ophthalmologist visits, surgical fees, and transportation. "I hope to start baking cakes again," says Eliza. "They are very delicious." Zipora is a 17-year-old woman from Uganda. She supports her mother by harvesting beans, maize, cassava, and potatoes from their small farm. She also sells goods, such as clothes, soap, and salt, at the local market. Finally, Zipora weaves mats for bedding. When Zipora became pregnant with her first child, her doctors considered the pregnancy to be high-risk, and they expected complications. Zipora's delivery date was October 18, 2016. Our medical partner, the Kellermann Foundation, provided experienced surgeons and the necessary medications to ensure Zipora would return home with a healthy newborn. Now, she needs help to pay her $241 healthcare costs. In the future, Zipora hopes to work hard and educate her baby. Joy, Zipora's mother, shares, "I wish to thank all donors who are supporting us during this very needy time, especially for my daughter's safe delivery." 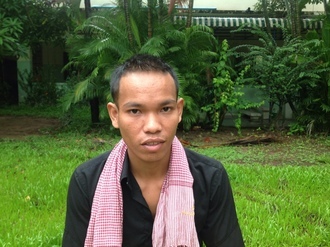 Kosal is a 23-year-old worker with one brother and three sisters. He likes to stay at home and watch TV in his free time. He was referred to CSC from a hospital in a different province. He traveled for three hours with his mother to reach CSC for treatment. 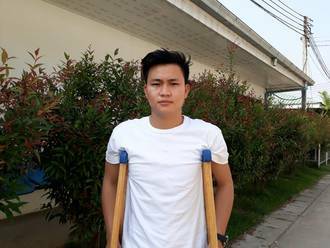 Kosal was in a motorbike accident earlier this year, which crushed the toes on his right foot. It is difficult for him to walk, and he is in pain. After his accident, he received treatment from a referral hospital for four days and then continued treatment in a hospital closer to his home for ten days. Due to his condition not improving, he was brought to another referral hospital for four days. His wound did not heal, so the surgeon referred Kosal to CSC for treatment. Surgeons will perform an excision and flap surgery to release the scar tissue and replace the area with healthy skin. This will allow Kosal to walk comfortably and relieve him of pain. Kosal says, "After the operation, I hope that I can walk normal and without pain." Meet Lai, a 74-year-old woman from Cambodia, married with 4 sons, 5 daughters, and 20 grandchildren. Lai enjoys visiting the pagoda to listen to the monks pray. She traveled 2 hours with her sister to reach Watsi's medical partner, Children's Surgical Centre (CSC), for treatment. Lai developed a pterygium in each eye three years ago. This causes her blurred vision, burning, and tearing. She can't see anything clearly, do work well, or go outside easily on her own. She needs surgery to remove the growth, allowing her to see clearly again without discomfort. The total cost of treatment for Lai is $148. After eye surgeons removed the pterygium from each eye, Lai will be able to see clearly and be relieved of pain, irritation, and tearing. “My wish is to get treated so I can see clearly again and continue working with my wife to provide for my family,” Mike shares. Mike is a 30-year-old father of two who lives with his wife and children in a two-room mud house in rural Kenya. Mike and his wife practice subsistence farming. Their town has been struggling with the problems of frequent cattle theft and low economic opportunity. This past May, Mike was hit by a tree branch while working on his farm. The branch made direct contact with his right eye. Ever since then, that eye has been causing him pain, and has been unable to perceive light in that eye. 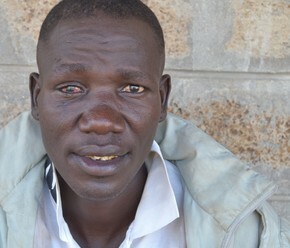 He has been using eye drops prescribed by a local dispensary, but this treatment has not improved his condition. Recently, Mike attended an eye camp organized by the nearby Kijabe Hospital. The doctor there diagnosed him with a traumatic cataract and recommended he undergo cataract removal surgery. However, Mike is not able to pay for this procedure, in part due to the toll that his injury has taken on his ability to work. Because of Mike's vision loss and daily pain, his wife has had to take over many of the tasks on the farm that they used to do together. But for $230, we can sponsor Mike’s operation, as well as the medications and brief hospital stay he will need for the surgery. With some financial assistance, Mike will be able to see clearly again—and get back to supporting his family. “We dream that our son will grow big and heathy, and be able to study when he is older,” shares Axel’s father. 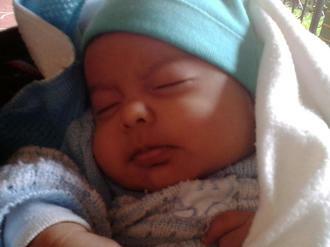 Two-month-old Axel is acutely malnourished because his mother cannot produce breast milk. She has been giving him water with sugar and rice. But he has still been losing weight steadily, and now weighs much less than when he was born. Recently, Axel has been crying and coughing a lot. With an immune system weakened by severe weight loss, even a simple cough or fever could be life-threatening. 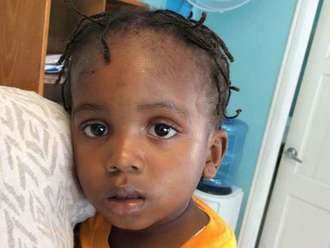 If Axel does not receive treatment soon, he could face the risk of seizures, permanent brain damage, and death. Axel is the youngest of four in his family. They live in a one-room house in a rural community in the mountains of Guatemala. His father works as a day laborer, making very little money when he finds work, and often having no source of income for days at a time. Axel’s mother spends her days caring for him and his siblings, cooking, and cleaning. Although Axel's life is in danger right now, treatment is simple and effective. For $1,016, he will receive formula for one year, until he is able to consume normal foods. This will help him gain weight, and develop normally both mentally and physically. His immune system will grow stronger, and his life will no longer be in danger. Furthermore, his mother and other family members will receive motivational nutrition classes in their home, so they will be able to know what foods to feed Axel so he can overcome his case of malnutrition and life a full and healthy life. Let’s help this family guide their son into a healthy childhood. Catherine is a 24-year-old woman from Kenya. "Her mother separated from her father and thus has been raising Catherine and her siblings alone," reports our medical partner, African Mission Healthcare Foundation (AMHF). "Catherine dropped out of school after completing eight classes due to lack of school fees. She works as a house help to earn a living." "Catherine has been having hearing problems since she was a little girl of age five. She was not able to access hearing aids due to lack of funds," continues AMHF. "Catherine has difficulty communicating. She is not able to perceive sound well and often requires one to shout or repeat conversations. This affects her daily interactions with people. When Catherine came to the hospital for treatment, hearing aids were recommended, but Catherine is not able to meet the full cost." With $712, Catherine can receive the hearing aids necessary to improve her hearing capability. "If not assisted with the hearing aids, Catherine will have poor sound perception and will continue having poor communication and social interactions," explains AMHF. Catherine shares, “My wish is to get the hearing aids and be able to establish my own tailoring shop." Let's help make it possible!